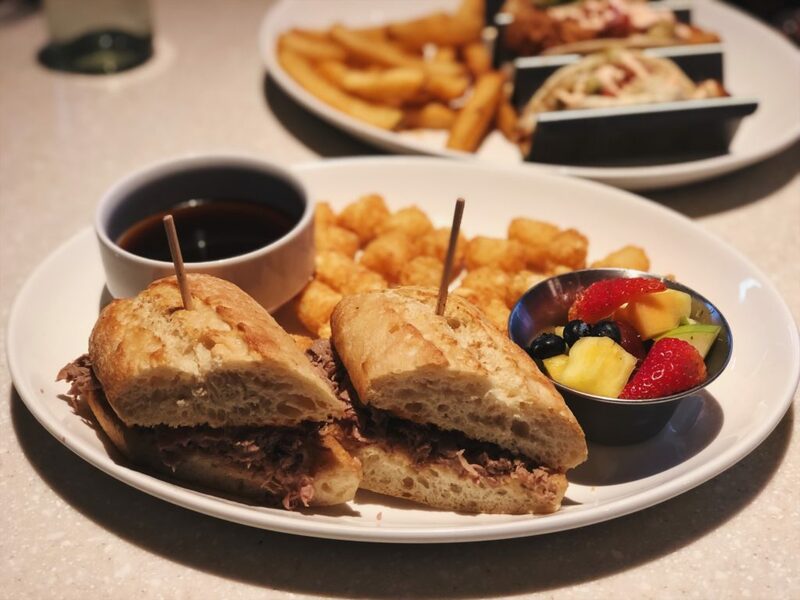 See what the hype is about at Bricktown! Head home or continue to explore! Disclaimer: We want to thank the Oklahoma City Convention and Visitor Bureau for inviting us as their guests. This post may include affiliate links. As always we only recommend places and products we love, all opinions are our own. 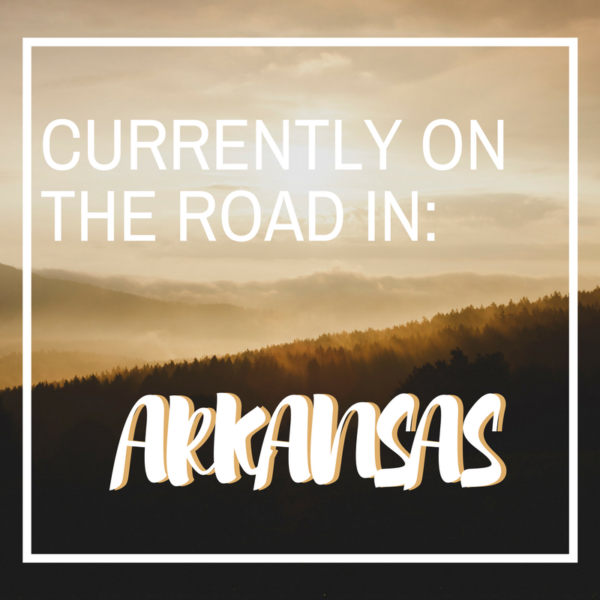 Oklahoma City has always been a few hours from us but now that we’ve moved to Arkansas, it’s even closer. We finally got the chance to visit and we both regret not having done so MUCH sooner. Oklahoma City is a big city with the heart of a small town. 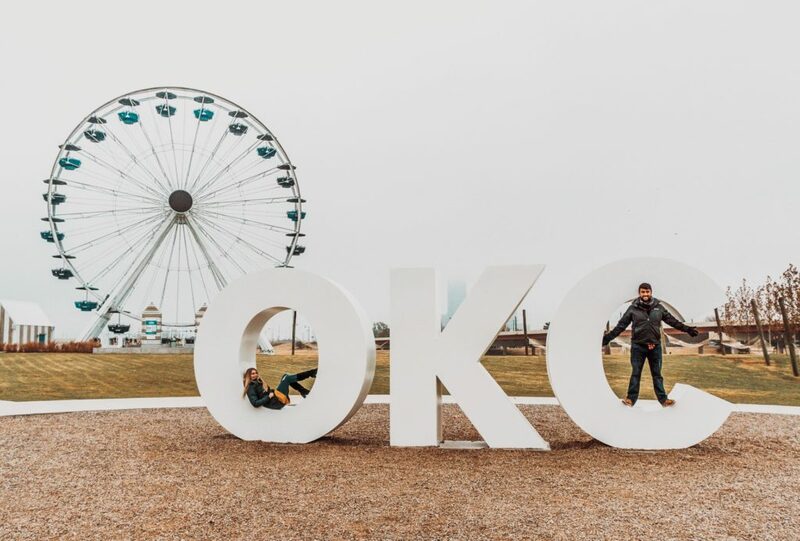 OKC is one of the fastest growing cities in the U.S., which was made apparent by the number people we met during our trip that had relocated here from other large cities. Why has this area in a flyover state become so popular? For starters, there are a TON of things to do and unique places to eat. 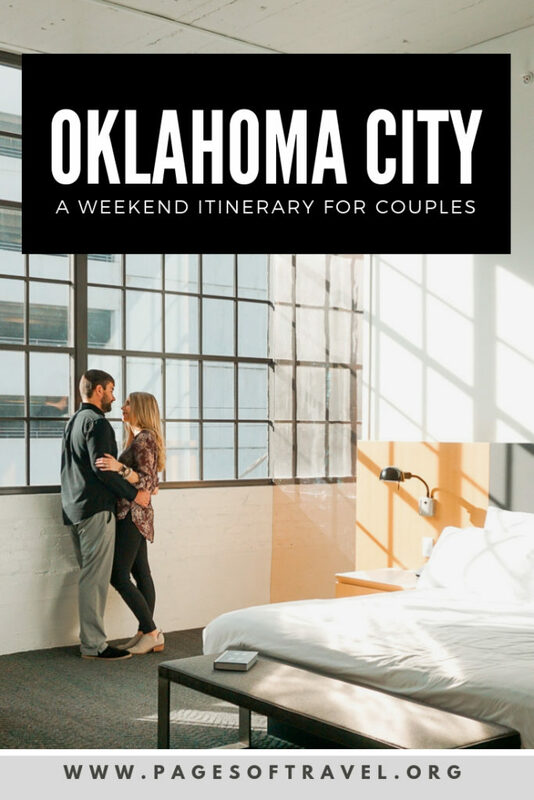 Our couples getaway in Oklahoma City was relaxing but full of fun activities and dining that could also be enjoyed with a group of friends or a family. Since we couldn’t leave until after work on Friday, we didn’t arrive in OKC until later in the evening. Upon arrival, we checked into the 21c Museum Hotel which is located right outside of downtown Oklahoma City. 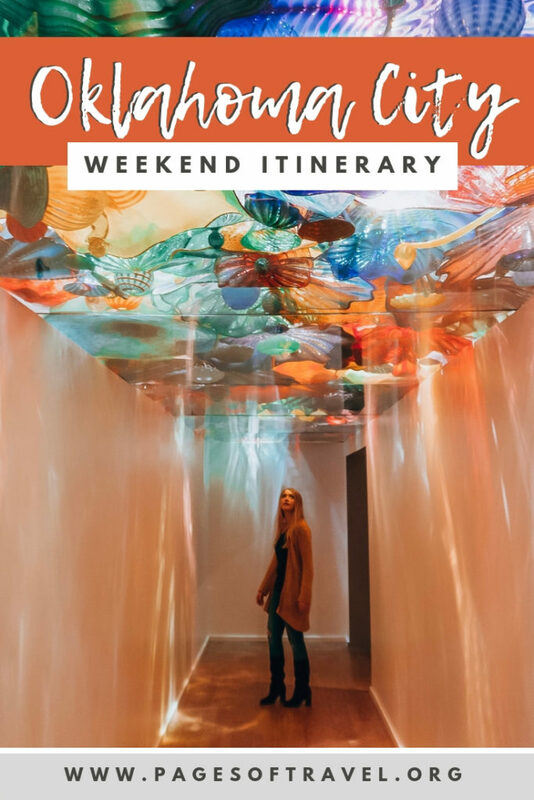 Because of its central location, the 21c is perfect for everything on this Oklahoma City itinerary. 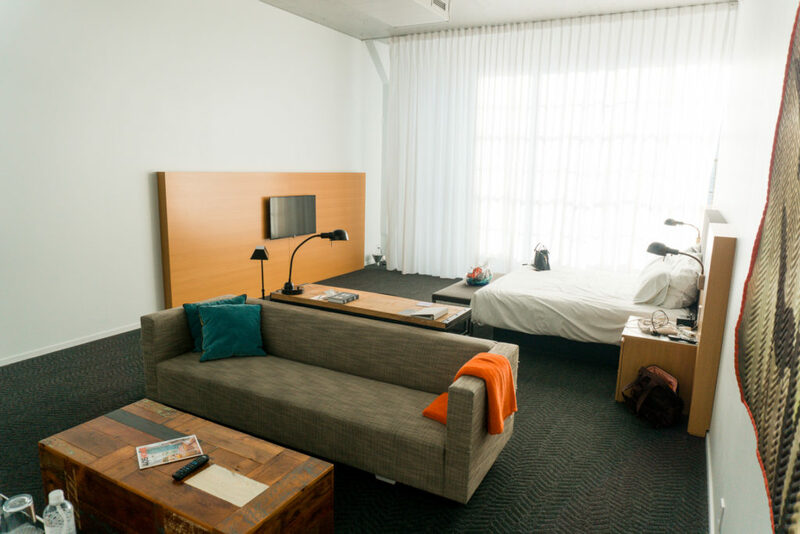 The 21c is a modern industrial style luxury hotel. 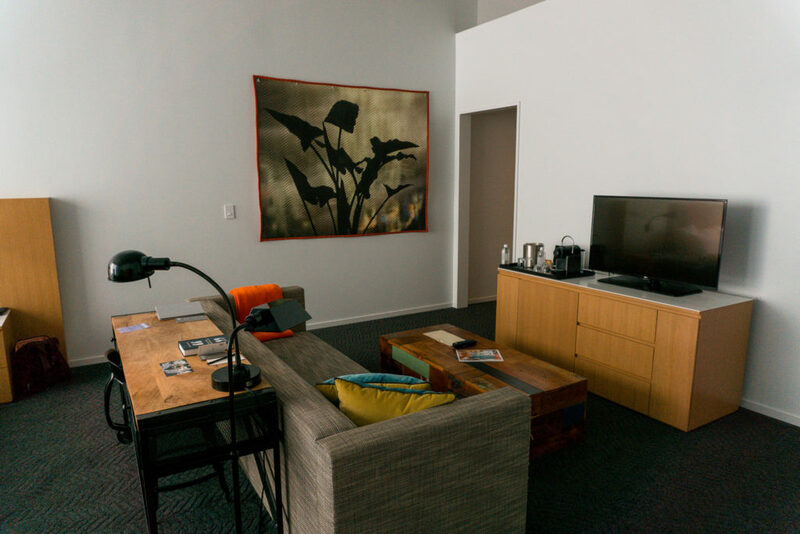 The rooms are incredibly spacious, each one is similar to a downtown loft-style apartment and the design is well thought out. Each space has its purpose but with the perfect amount of minimalism. Our personal favorite touches in our room were the plush king-sized bed and the living room nook that was perfect for watching a movie or reading after settling in for the night. Another added perk? The roomy bathroom! We both had plenty of space to get ready for the day without bumping into one another – counter space is honestly a rarity at a lot of hotels! But our favorite part about the 21c Museum Hotel is the free art museum located on the first floor of the hotel. 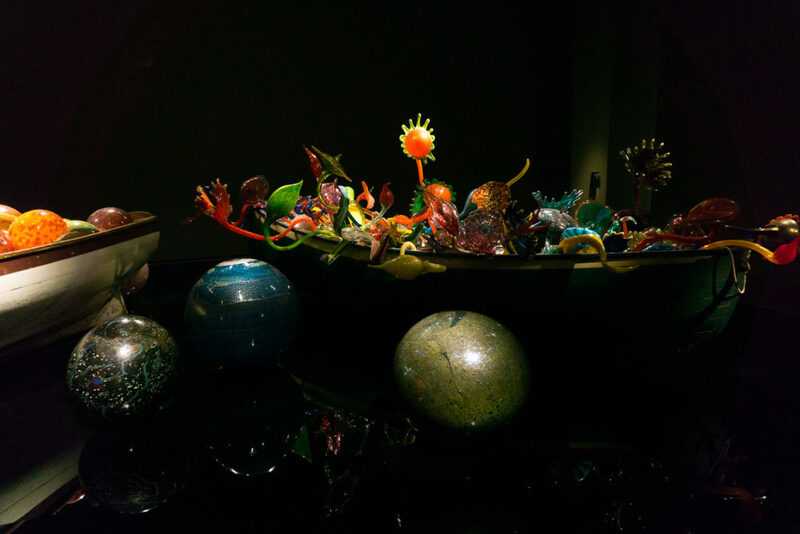 The museum contains many modern and contemporary art pieces that are beautiful and thought-provoking. After dropping off our bags we decided to explore the museum and peruse the bar at Mary Eddy’s, the attached chef-driven restaurant, before calling it a night. Rise and shine! 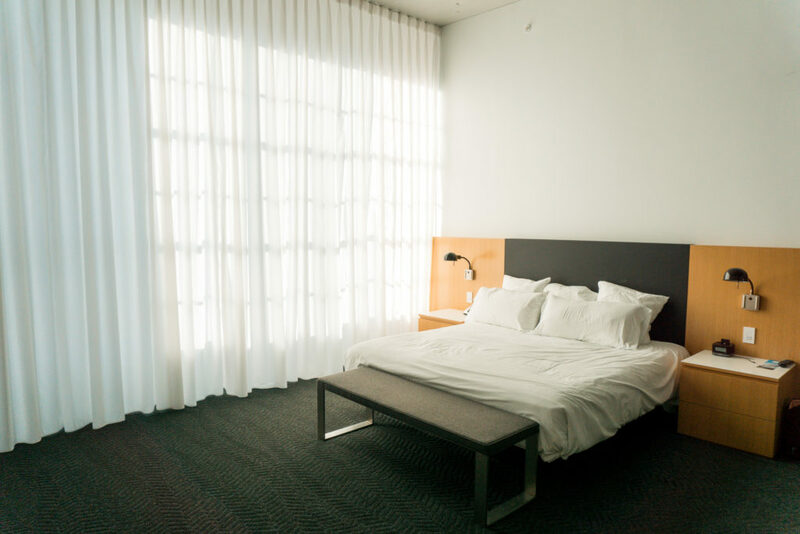 Wake up from your comfy bed at the 21c Museum Hotel OKC and take a moment to open up your windows and enjoy the beautiful sunshine. If you overslept, don’t worry! 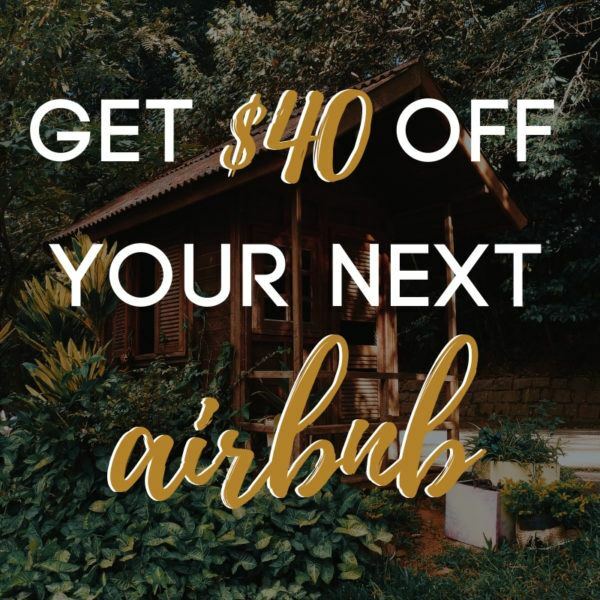 Your first stop is just a few steps away. 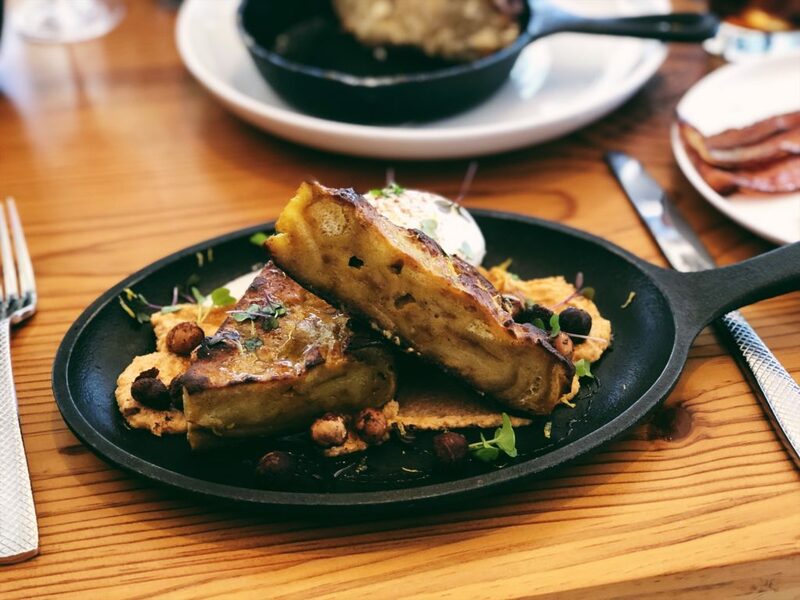 If you’re looking for the best brunch locations in OKC we’ve got you covered. Our first stop is Mary Eddy’s! 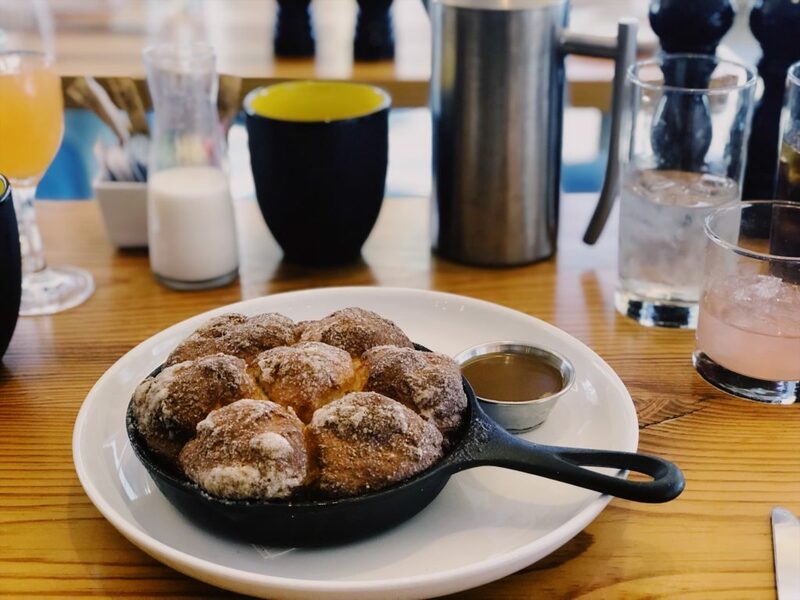 We’re brunchaholics and couldn’t resist gorging ourselves on yummy monkey bread biscuits, avocado toast, and french toast bread pudding. Are you salivating yet? ‘Cause we are! If that’s not enough to get you going give their cold brew coffee or a french press a try. We also got two of their brunch time cocktails that were dangerously delicious. 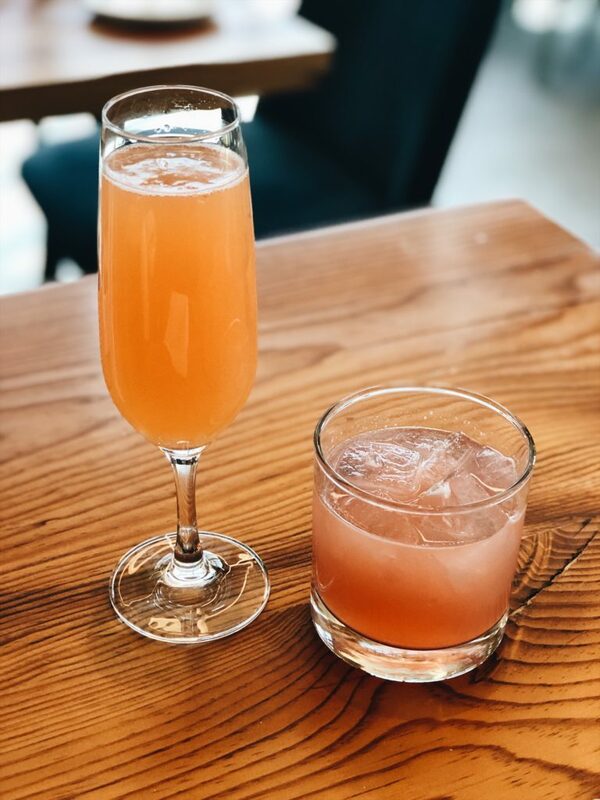 The first of the two cocktails we tried was the Boozy Blossom, which was made with prosecco, hibiscus, orange blossom, and good ol‘ fashioned OJ. Think of it as a more glamorous mimosa. The other cocktail we tried was the Gin n’ Jam. I know what you’re thinking…. gin?… in the morning? YES. This cocktail has a splash of gin, earl grey tea syrup, lemon, and housemade jam all mixed together to make your taste buds smile at first sip. After brunch, you’ll head to the Oklahoma City National Memorial & Museum. 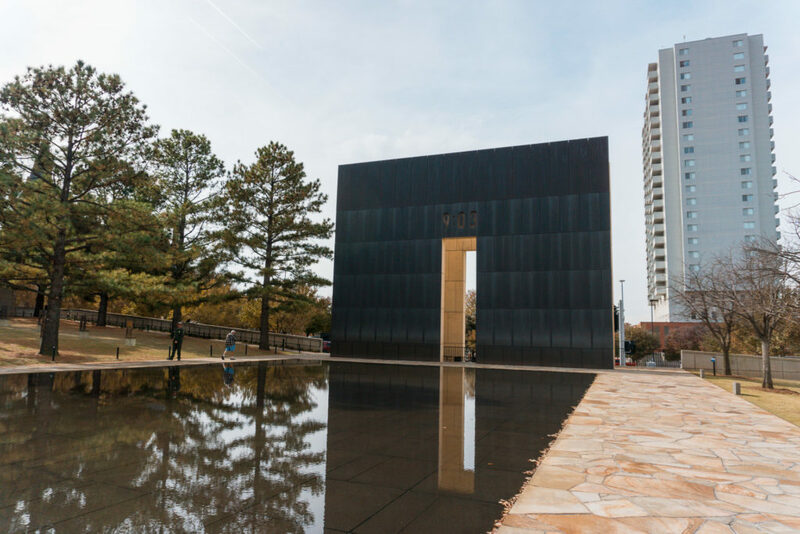 Whether it’s your first visit to Oklahoma City or you’ve visited numerous times before, this beautiful memorial and museum is a stop that you simply cannot miss. On April 19, 1995, Oklahoma City and the world was forever changed when a truck bomb went off at the Alfred P. Murrah Federal Building at 9:02 am. This domestic terrorist attack that killed 168 people, left over 680 people injured, and damaged over 324 buildings. Among those there that day were citizens visiting the government building, countless government employees, and children that were enrolled in a daycare held within the building. 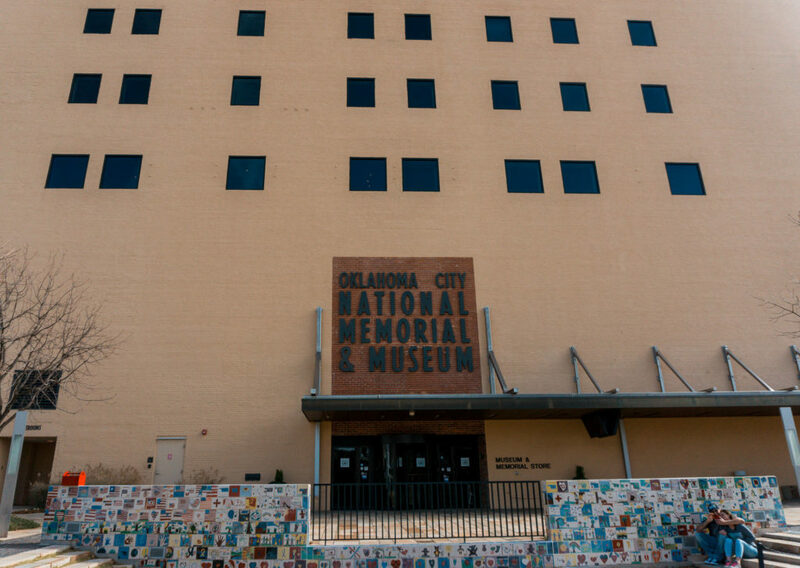 The Oklahoma City National Memorial & Museum will move you in more ways than one. First, it will navigate you through an area of the museum where you can see artifacts, read information, and hear recordings of firsthand accounts. Second, it will move you emotionally. While we were going through the museum we felt a wide variety of emotions – sadness and anger, but also hope. The museum shows how the people of Oklahoma City rallied together and put every part of themselves into helping the rescue effort. It reminds visitors of how the people encouraged and comforted those in pain, both physically and emotionally. There’s a quote that is posted in numerous locations around the site that left a lasting impression on us. It says: “We come here to remember those who were killed, those who survived, and those changed forever. May all who leave here know the impact of violence. May this memorial offer comfort, strength, peace, hope, and serenity.” In order to really take your time in this memorial, be sure to allow for around 2-3 hours. 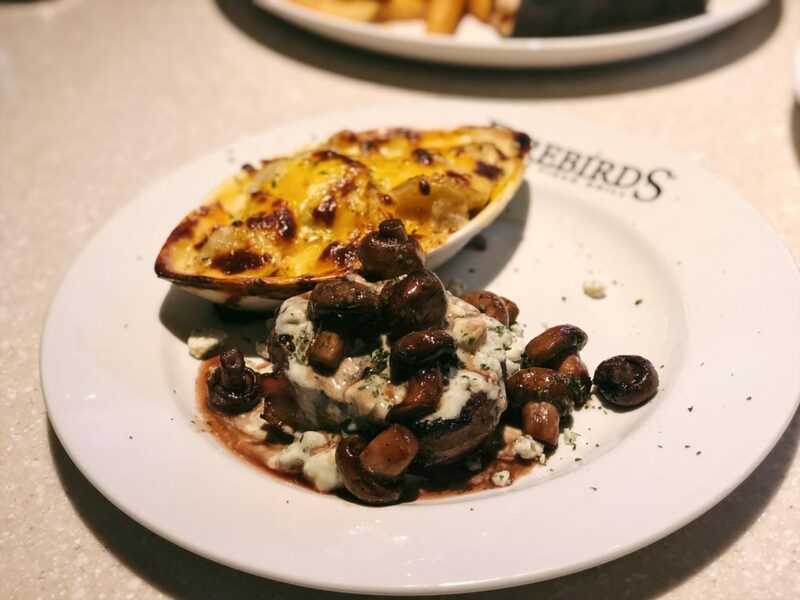 After finishing at the Oklahoma City National Memorial & Museum we headed a few miles out of the city towards Northwest OKC to have lunch at Firebirds, an American restaurant known for their wood-fired grill entreés. 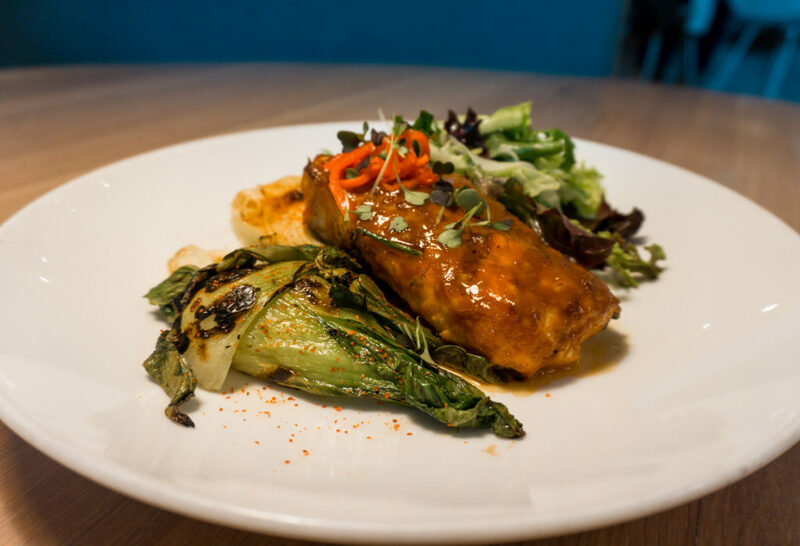 We had a sampling of a few menu items and were blown away by everything we tried. 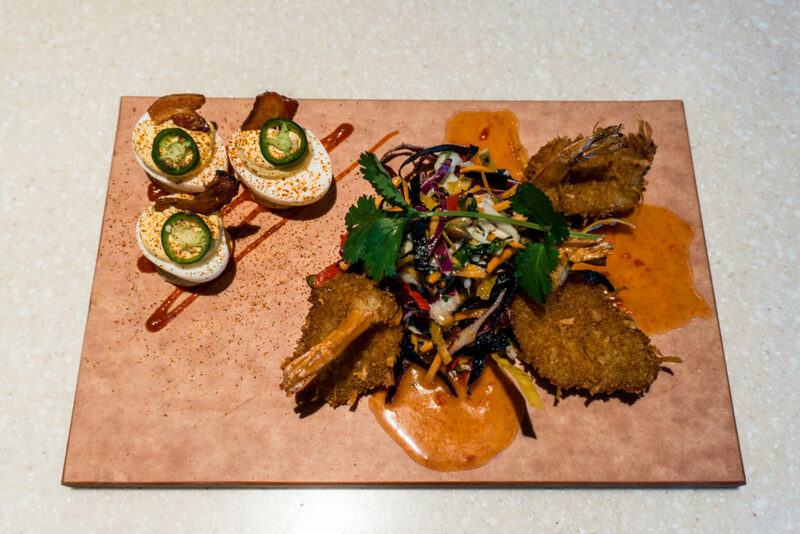 For starters, they brought to our table their deliciously creamy jalapeño deviled eggs, a giant lobster spinach queso, and coconut shrimp which was perfectly fried to a crisp. For my entree, I had a combo of their shrimp and fish tacos, which were perfect for lunch. While Logan enjoyed a prime rib french dip and bleu cheese filet. Now, I want to take a moment to talk about this steak because if you know Logan… he is very particular about steak and typically avoids ordering them when eating out. There has only been a small, and I mean SMALL handful of steaks that he claims are worth shelling out money for. He was so impressed by the bleu cheese filet at Firebirds that he ended up talking to the chef trying to figure out how he cooked it. The filet was wrapped in bacon and prepared medium rare. After, it was topped with a bleu cheese sauce and port mushrooms. On the side was the southwest au gratin potatoes which were the perfect pairing for this steak. 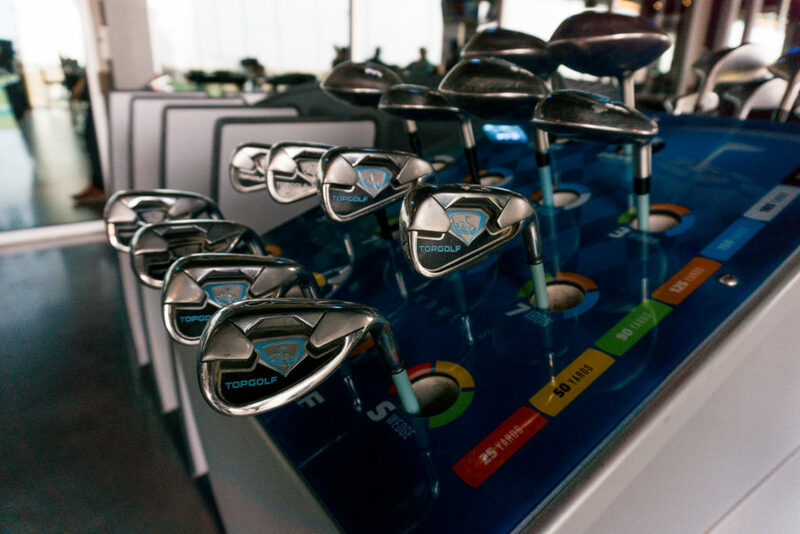 So, I’m just gonna come out and say it, golf is seriously underrated and TopGolf is an inexpensive way to practice your skills or just have a good time. 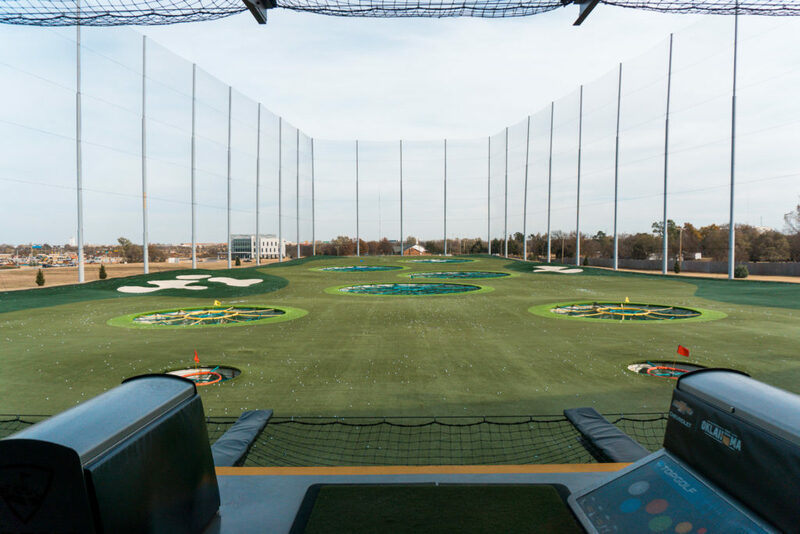 TopGolf is basically a big driving range where you can rent out a “bay” to hit some golf balls out to the various targets (see photo above). There are different games to play based on points, distance, etc. Chances are if you rent a bay for an hour or two you’ll get a chance to play many different game modes! 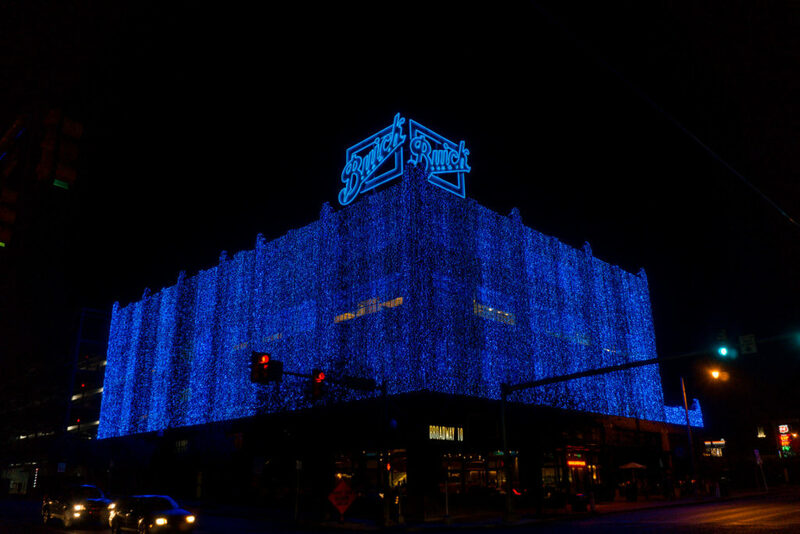 When we visited the weekend of November 16-18 the annual Lights on Broadway event in Automobile Alley was up and ready for viewing. Since it gets dark at 4:30 pm this time of year (who’s idea was that again?) the sun was already setting when we left TopGolf so we were able to see all the twinkly lights come on! There’s just something magical about all those dainty, colorful lights and the holiday season – you just can’t help but smile. While the evening was chilly we were greeted with free hot cocoa, cookies, hot apple cider, candy canes and even a Whoville drink that was topped with cotton candy! Not only does this annual event provide you with complimentary refreshments, but there is also free entertainment too! We saw jugglers, live bands, caricatures, face painting, balloon animals, pictures with Santa, and even a holiday movie showing next to some warm fire heaters. If you need to thaw out your fingers and toes simply head into one of the local boutiques or stores and shop their adorable holiday decor and gift ideas. 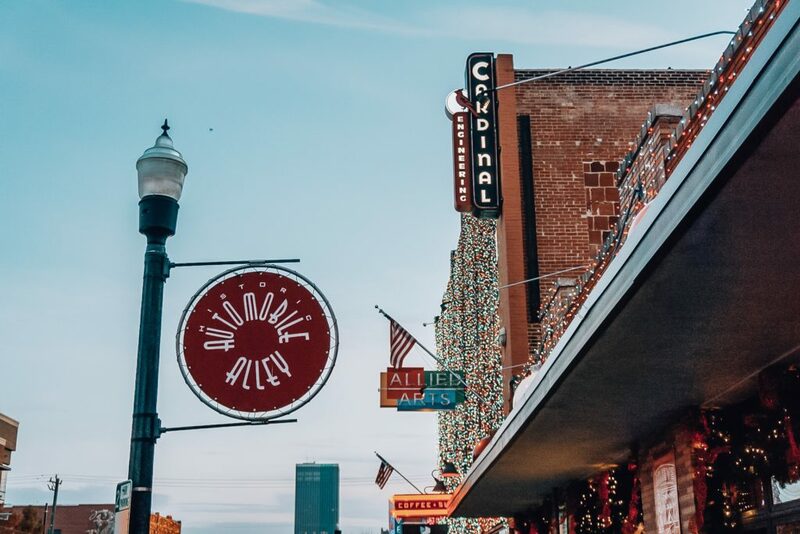 If the Lights on Broadway event isn’t happening like it was for us, you can still enjoy visiting the pretty lights and holiday decor or the specialty shops and the street art in Automobile Alley. There is plenty to do and see here even without this special event! After checking out Automobile Alley you can walk over to the temporary art installment a Campbell Park. 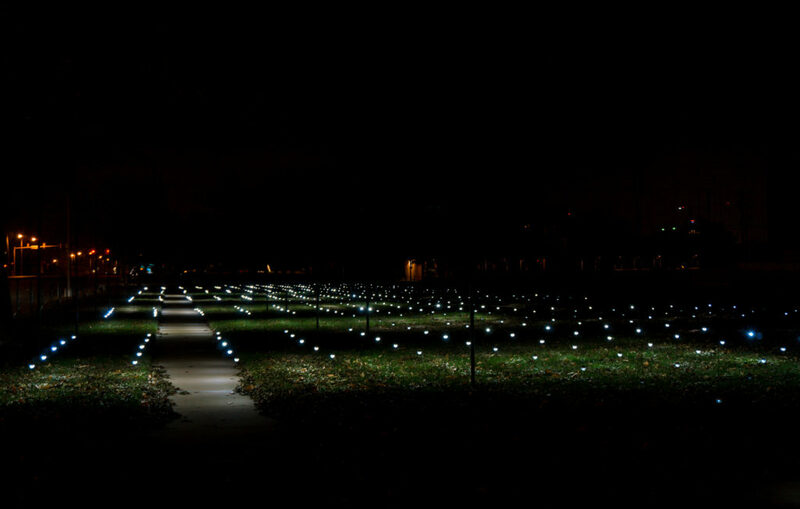 Whiteout by Erwin Redl, is a grid of suspended LED bulbs (550 to be exact!) that sway with the wind creating moving patterns over the park. It was originally seen in Madison Square Park in New York City, but Redl recreated this fascinating display for this location in OKC. There was something so peaceful and soothing about watching these lights move with each gentle gust of wind. It was almost as if we forgot we were in the city and were looking at the stars upside down! Since you’ll be close by don’t miss a chance to see it during your couples getaway in Oklahoma! 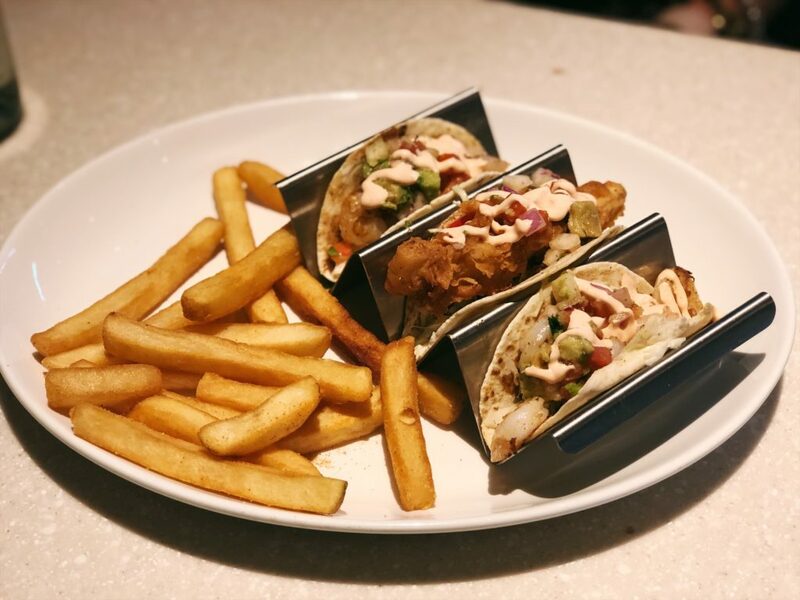 After all that golf, walking, and shopping you’ll be ready for dinner and The Drake is the perfect stop! The Drake serves up some of the best seafood with the freshest ingredients you’ll find in OKC. They even have their own oyster bar that has become the talk of the town. 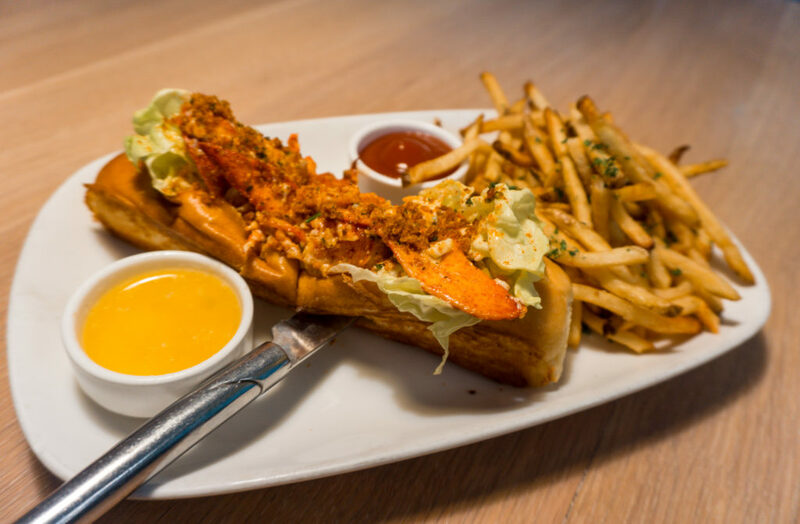 We ordered two different dishes to share, the first being the Lobster Roll which we felt was the closest thing you’ll get to the real deal outside of Maine. The second entree was the Miso Glazed Salmon that was recently put on the menu. It had the perfect amount of sweet and savory flavor and by the last bite, I was nearly begging for the recipe. 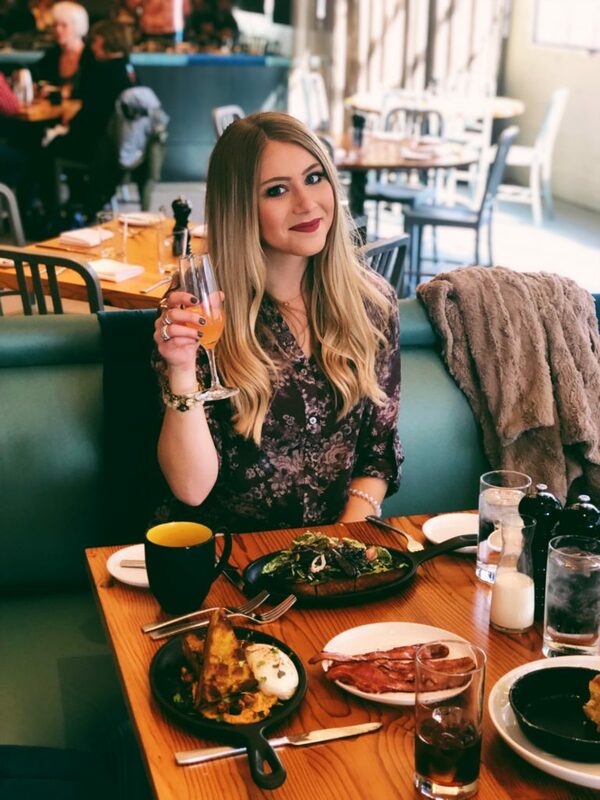 Overall we felt that The Drake was the perfect place to end our evening and enjoy a romantic dinner in OKC with the amazing food, wine selection, and ambiance that they have to offer. 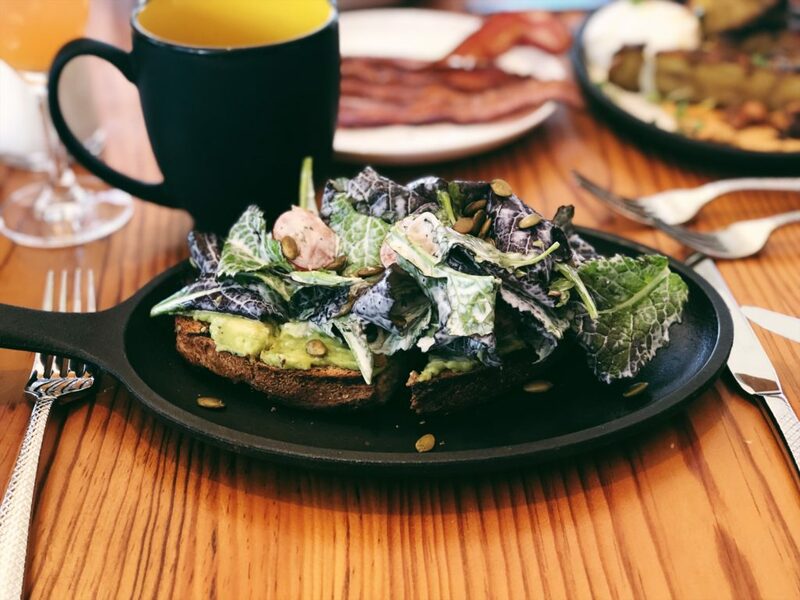 It’s your last day in Oklahoma City and hey, we told you we’d show you to the best brunches in OKC so here’s another spot! The Jones Assembly is truly a unique place. 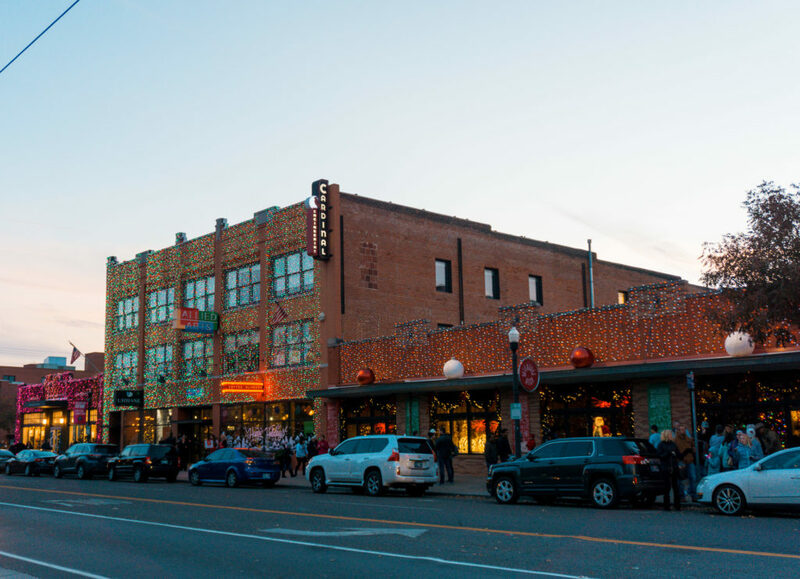 It’s not only a fully operating restaurant, but it’s also a concert venue that hosts local and nationally recognized artists. 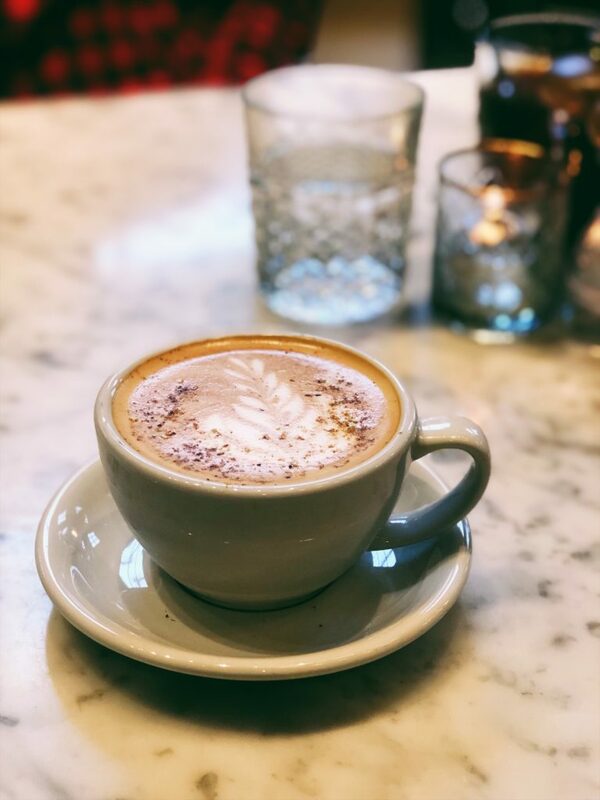 We immediately wanted to try their handcrafted lattes and ordered the Pistachio Latte per recommendation. It had the perfect amount of bold espresso paired with a lightly sweetened flavor of the pistachios. 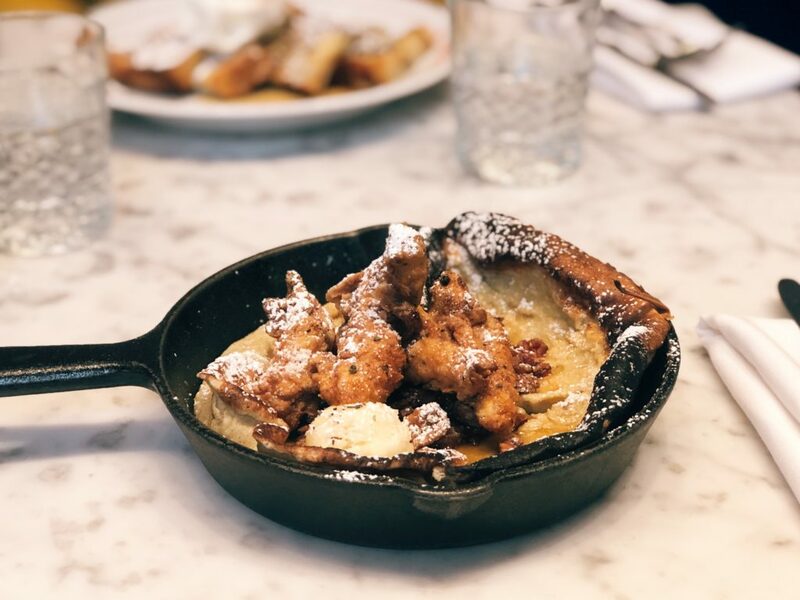 Afterward, we ordered the savory Dutch Baby Cakes that came topped with fried chicken, and crispy bacon. 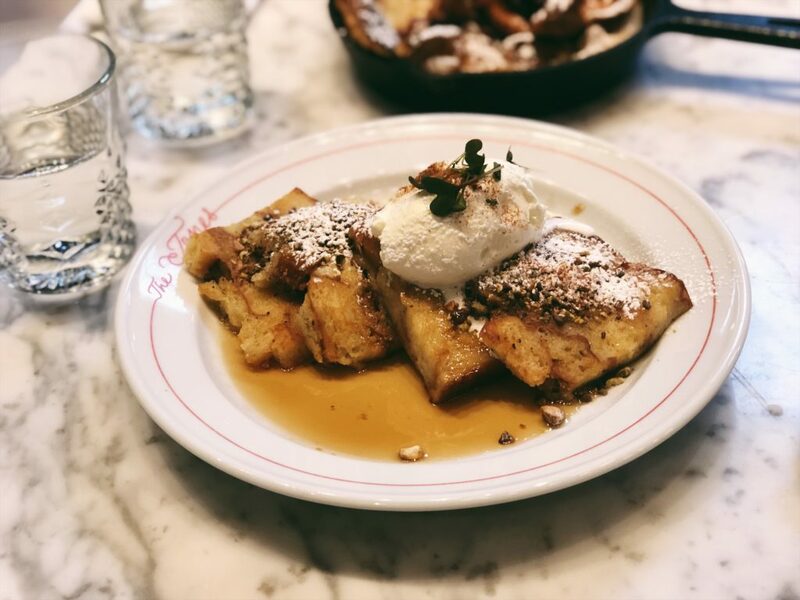 We also ordered the brioche french toast with a pistachio chocolate crumble and chantilly cream. Both of these entrees were refreshing and unlike any other brunch entrees we’ve had! Have we sold you yet? When we visited, the Myriad Botanical Gardens were undergoing a few renovations. We would both would be very interested to see what all the changes look like once it’s completely finished. The outdoor gardens (which are free to visit) have many walking paths and water features. There is also a children’s garden and an off-leash dog park if you plan to bring your pup along for your trip! 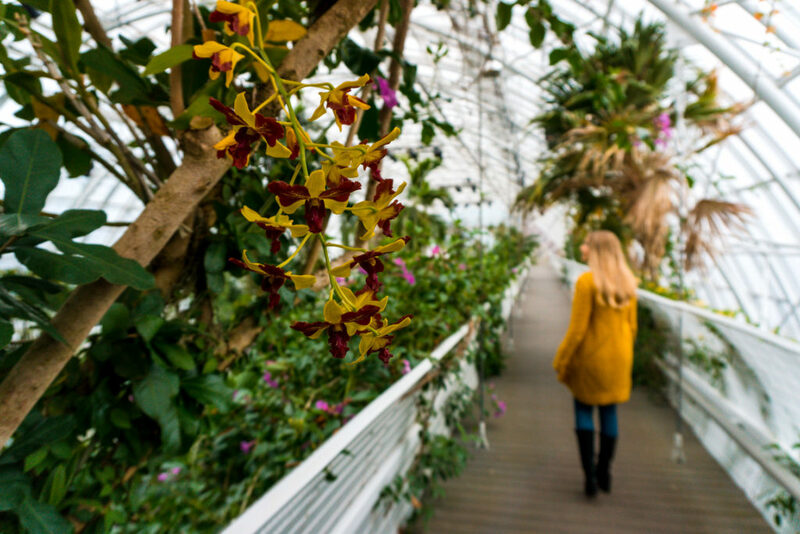 The Crystal Bridge Conservatory, where we spent most of our time, is a climate controlled environment filled with thousands of plant species from all parts of the world. 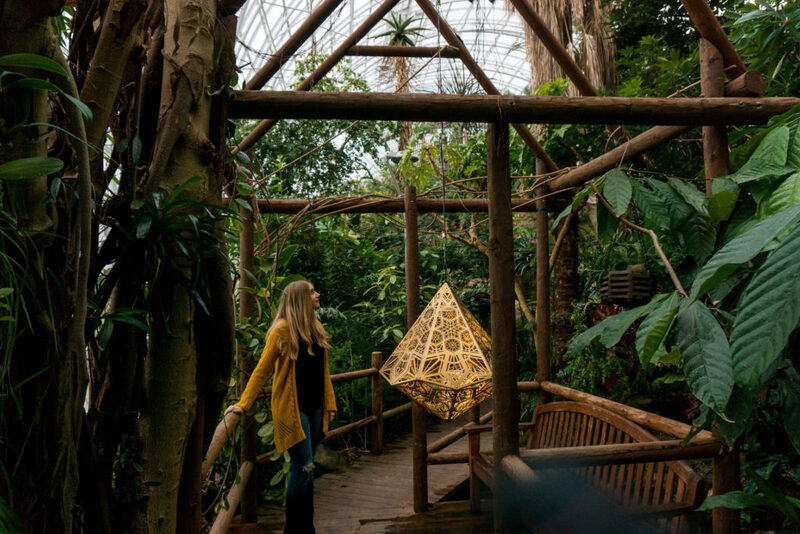 We were mesmerized by the lush greenery and were really intrigued by all of the species of cacti located in one area of the conservatory – who knew there were so many!? 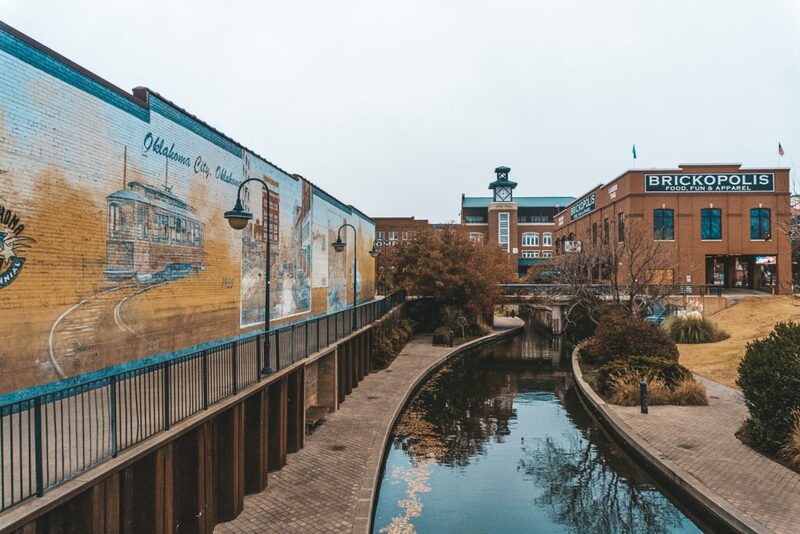 Chances are if you’re visiting Oklahoma City you’ve already scoped out things to do in Bricktown. 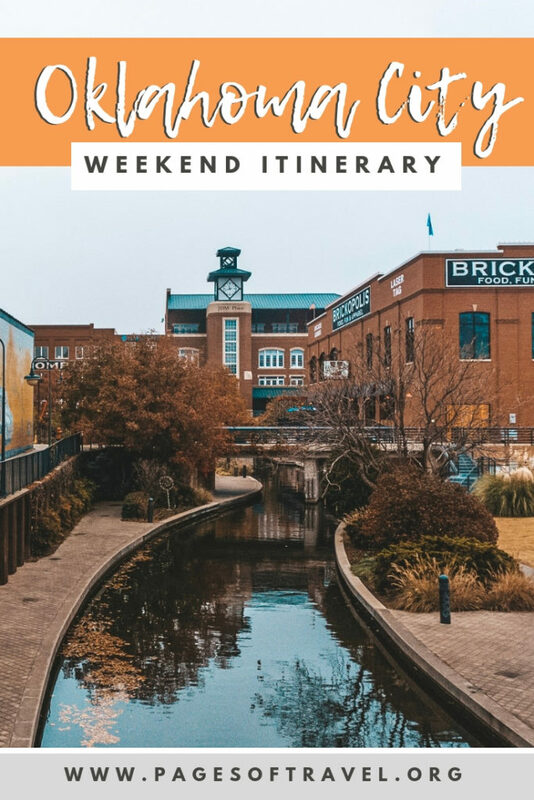 Bricktown is a popular entertainment area in OKC and was one place we knew we had to stop at while we were here for our couples getaway in Oklahoma City. It is home to many large event centers, sports arenas, local restaurants, and museums. Take a ride on the Bricktown Water Taxi for an entertaining perspective of OKC. Then grab a cupcake at Pinkitzel, a candy and cupcake shop that is every dessert lovers paradise. After, stop by Bricktown Brewery for an app and pint. 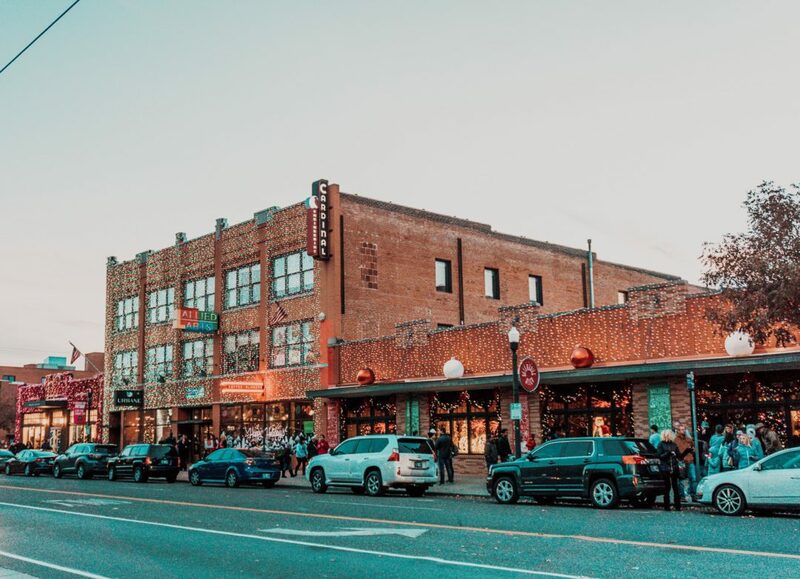 You can easily spend a few hours enjoying the walkable Bricktown district. 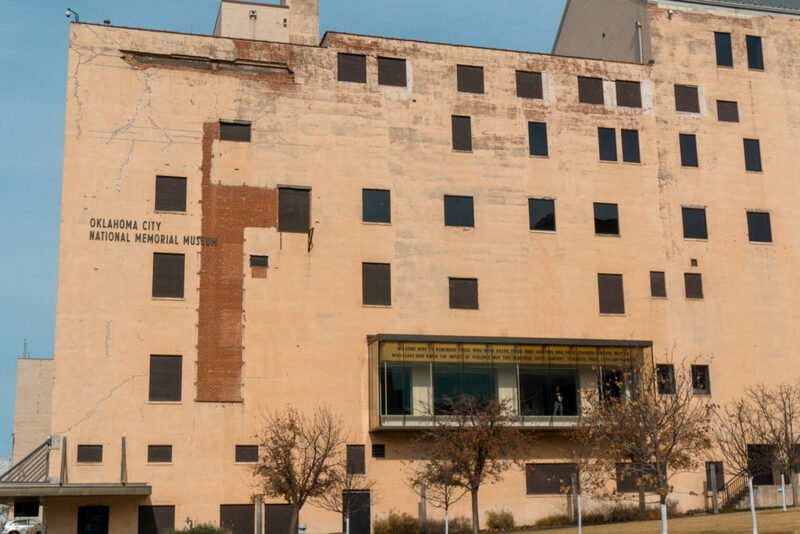 After spending some time in Bricktown we went to one of the most interesting places in OKC. 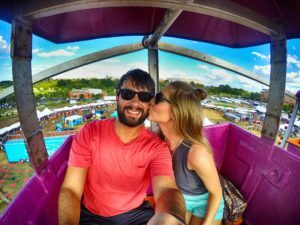 If we told you that this Ferris wheel was purchased on eBay would you believe us? Well, we ain’t lyin’! The Wheeler Ferris Wheel was originally a Santa Monica Ferris Wheel that was spotted and scooped up off eBay and rehomed here, in Oklahoma City. Now it’s a historic tourist spot to visit in OKC. Make sure you take a ride to the tippy top and snap a photo by the OKC sign with the Wheeler in the background! After visiting the Wheeler Ferris Wheel we headed to The Oklahoma City Museum of Art to warm back up! The Oklahoma City Museum of Art has an impressive collection from all different time periods but predominately pieces from the nineteenth and twentieth centuries. 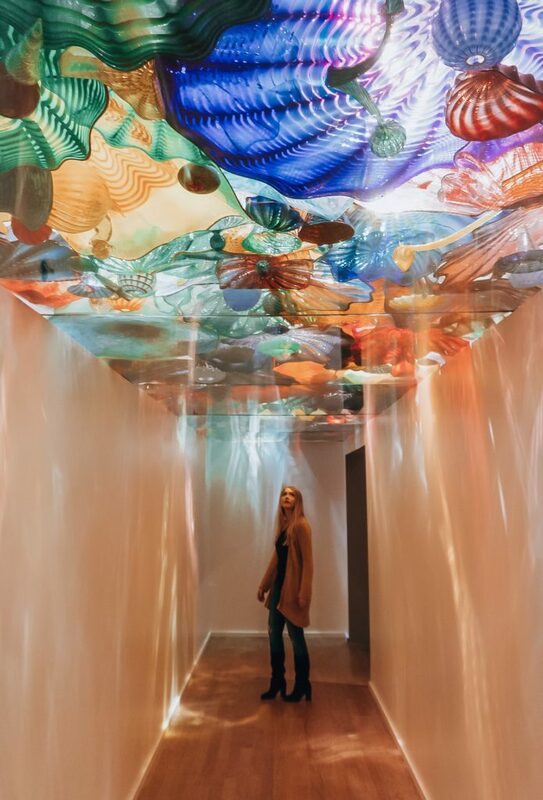 Being big fans of Dale Chihuly, we were impressed to see the large exhibit solely dedicated to his work and loved strolling down the hall where a ceiling of his glass works are on display. 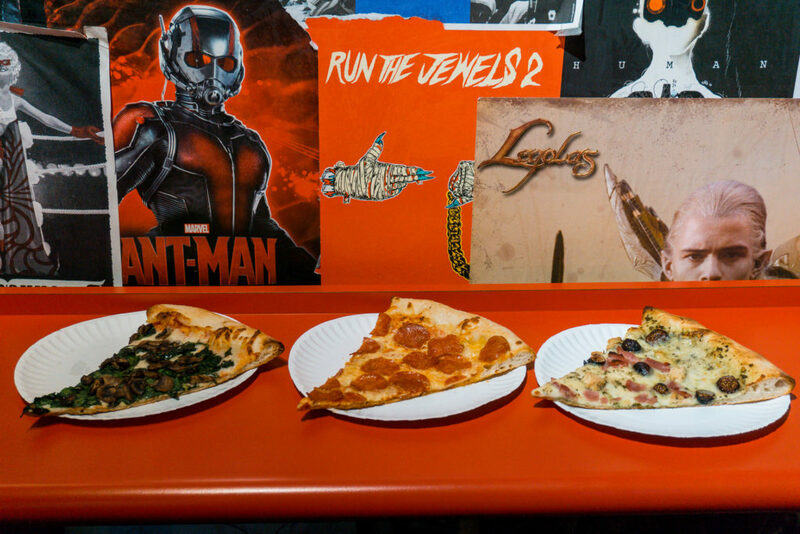 We could just about eat pizza for every meal. No seriously, we could and if Empire Slice House was closer, we would. This cozy pizza joint is super casual, like order by the slice at the counter, get your coke from a can casual. But, we wouldn’t want it any other way. They have the classic favorites like cheese and pepperoni, but they also have their own spin on pizza flavors. Our favorites being There’s A Fungus Among Us, a mushroom-topped pizza and Figgy Stardust, a chicken and fig topped pizza slice with a basil pesto sauce. Empire Slice House is the perfect lunch spot before your next stop on your OKC weekend itinerary. Surprise! Empire House is located in the Plaza District so just step outside and begin your journey. 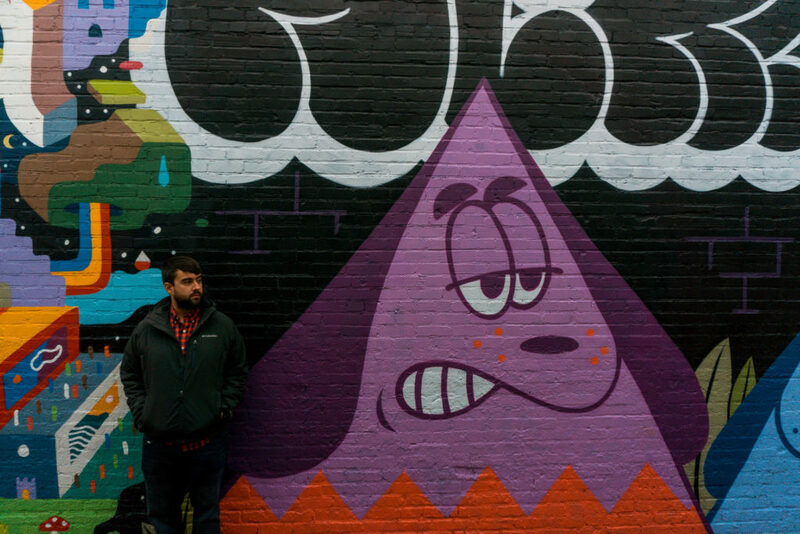 The Plaza District is a funky, cool area to walk around, shop, and you guessed it, murals on nearly every wall. The street art in this area is one-of-a-kind because it is redone every month so catch your favorite piece while you can! After spending some time in the historic Plaza District we made our journey back home. 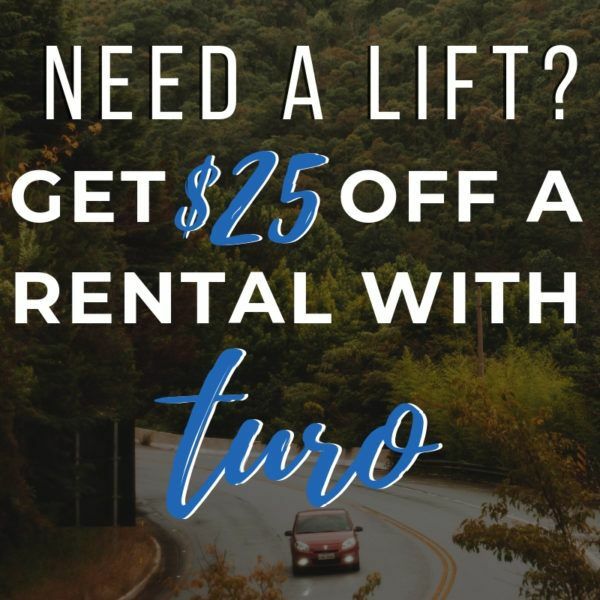 Depending on your schedule and travel distance you may want to stay a little longer. 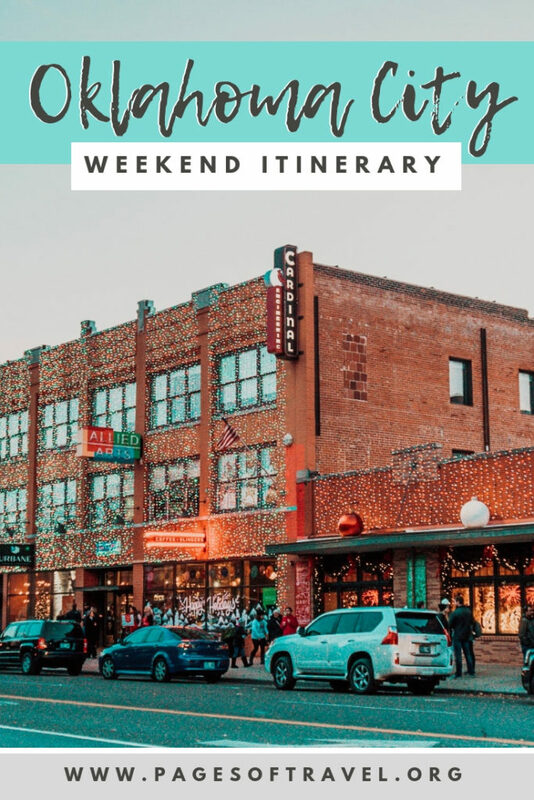 If so, here are a few things you could add to your itinerary for your couples getaway in Oklahoma that we didn’t have the chance to check out but you might enjoy! Climb Up: A set of grain silos that have been renovated into a climbing gym! How fun is that? American Banjo Museum: This museum contains over 300 banjos and the history of this fascinating musical instrument. SKELETONS: Museum of Osteology: If you’re interested in unique places you’ll love this museum! It is the only skeleton museum located in the United States and is an educational experience on the form and function of the skeletal system. Attend A Sporting Event: Depending on the time of year there are TONS of different sporting events you could attend while in OKC such as an Oklahoma City Thunder basketball game or an Oklahoma City Dodgers baseball game. It’s safe to say we left OKC 10 pounds heavier from all the yummy food but hearts even fuller due to the countless experiences. 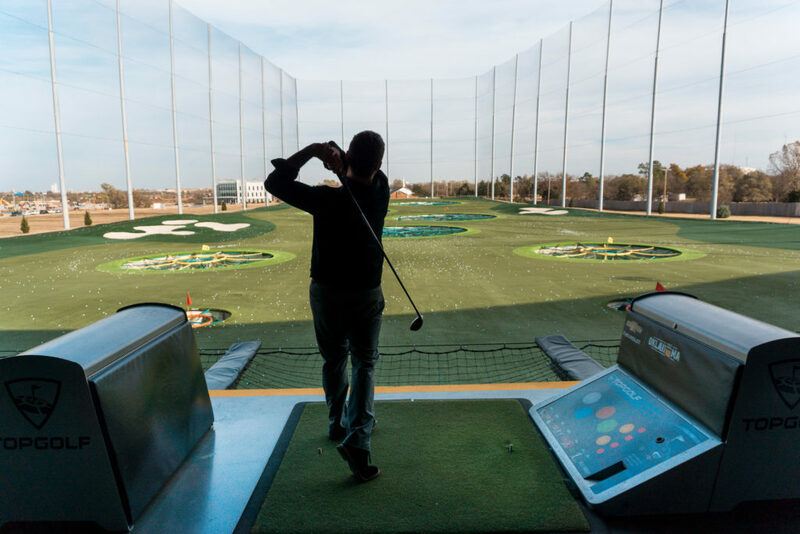 Which of these attractions or restaurants in Oklahoma City are you most looking forward to?